A few years ago, in early spring, I was traveling through McDonald Woods at the Chicago Botanic Garden, searching for some of the flat-bodied crab spiders (Philodromus) that typically spend the winter in communal groupings under the loose bark of dead trees. Upon reaching a small stand of dead American elm trees, I began to lift the loose remaining bark away from one of the trees to see if any spiders were present. As I gently pulled the bark away from the trunk, a tiny black hand reached up over the top edge of the bark. It quickly became obvious that there were more than spiders under this bark! Although I was a little startled to have this hand slowly reach out in front of my face, I immediately realized that this piece of loose bark was the day roost of a silver-haired bat. The silver-haired bat is a medium-sized bat that is a dark chocolate brown or black with white hairs scattered among the dark hairs on its back. I gently released the bark so as not to disturb the napping bat any more than I already had. This is just one example of why it is important to maintain at least some dead standing trees in our woodland communities. Even though bats are fairly common mammals in our area, since they are almost totally nocturnal, we don’t get to see them all that often—especially at close range, when we would be able to admire their delicate form and attractive appearance. Bats are in the order Chiroptera, roughly translated as “hand wing,” and are the only mammals that are actually capable of true flight (unlike flying squirrels—which we also have at the Garden). You might be familiar with another group of small mammals known as shrews. Shrews are mouse-like animals that are actually carnivores that feed heavily on invertebrate populations. 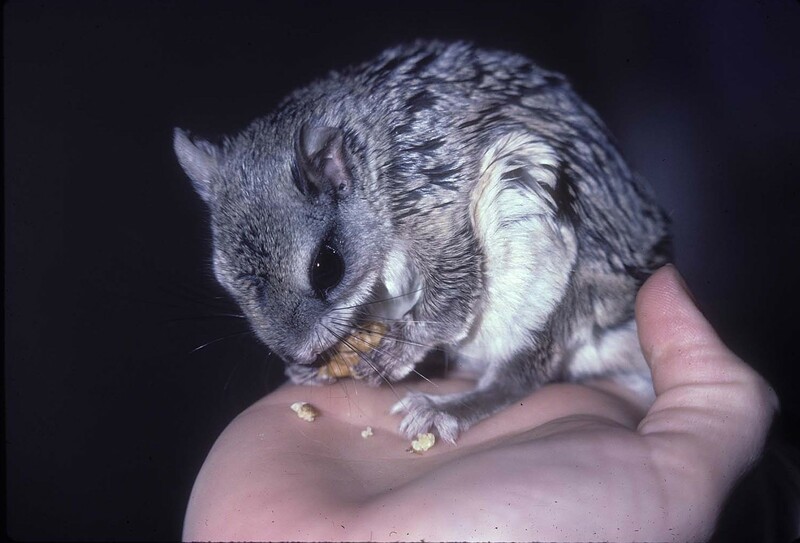 Although bats may have varied diets around the world, here they are primarily insect eaters, much like shrews with wings. When I was in college studying mammology, we used to go out at night and look for streetlights where there were large numbers of moths and other flying insects attracted to the lights. We would then take out our car keys and jangle them around to make high-pitched sounds with the keys clinking together. These high-pitched sounds would simulate the high-pitched sounds produced by the echolocation sounds produced by hunting bats to locate their prey. (Unless we are equipped with special listening devices, we are not able to hear the sound of bat echolocation.) Often times, many of the moths would begin flying erratically, or drop out of the air as though they had been struck with a stupefying charm from Harry Potter’s wand. These moths have evolved defensive tactics to help them avoid being eaten by bats by flying in erratic patterns or closing their wings and dropping if they heard the sounds of an approaching bat. Many years later, while removing invasive garlic mustard from our oak woodland a few summers ago, I came upon an oak tree with a broken branch. All of the leaves on the branch had turned a bright reddish-brown that stood out against the backdrop of all the other green foliage. On closer examination of the branch, I spotted a female eastern red bat hanging upside down, in typical bat fashion, with its single offspring clinging to it. I don’t know if the bat was aware of it, but this dead branch provided the perfect camouflage for her rich color. We have five species of bats that are likely to be seen at the Garden. 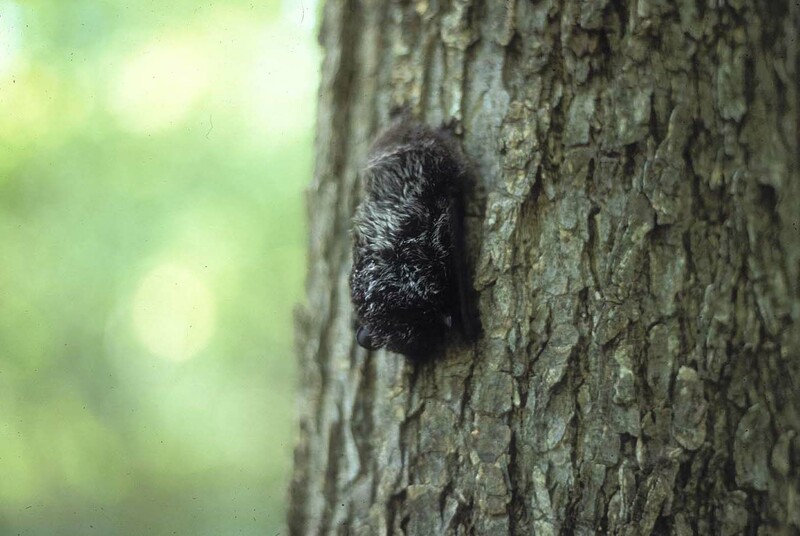 Some of them are summer residents, like the little brown, big brown, and eastern red bat, while others are mostly migratory species, like the silver-haired and hoary bats that show up during their spring and fall migrations. Years ago, in the late fall, while using fine nets at night to capture owls for attaching U.S. Fish and Wildlife Service bird bands, I often caught many of the large, hoary bats migrating south for the winter. 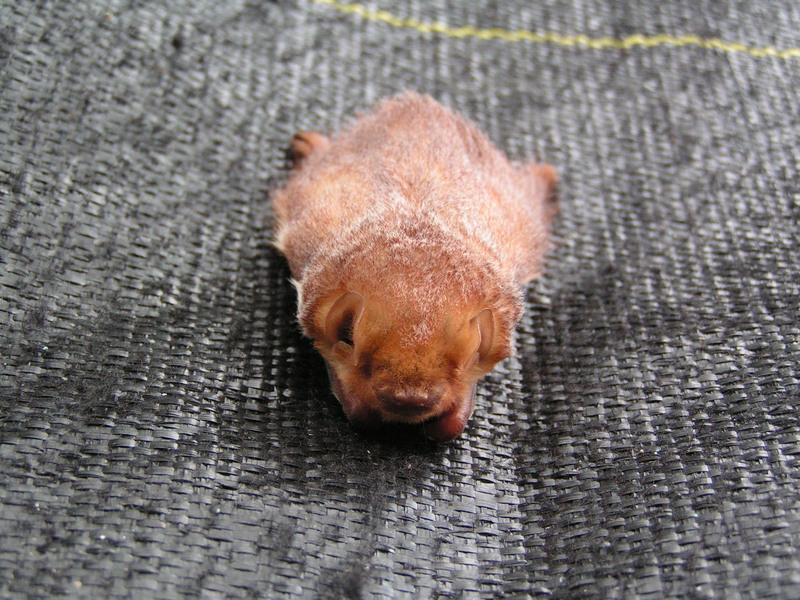 These large bats have an attractive frosted appearance with a mix of white and reddish hairs all over their bodies. While I was studying birds in the tropical rain forest of Central America, I often encountered small colonies of bats hanging at eye-level, under the broad leaves of Heliconia plants. I think these wide, tent-like leaves were chosen mostly for the protection they gave the bats from the torrential downpours that occurred every day. However, the bats we find here are either solitary animals, like the red, silver-haired, and hoary bats that live solitary lives in the woodlands and forests, or they are colony-forming bats, like the little and big brown bats, that search out attics, barns, or large hollow trees where they gather in groups to raise their young. Some of the bat species also search out caves or old mine shafts during the wintertime, where the subterranean habitat provides moist, stable conditions with above-freezing temperatures suitable for hibernation. It is possible to construct bat houses that, if placed in the proper locations, can attract and support colony-forming bats during the summer. We have several of these bat house installed on buildings around the Garden. This summer, one of those houses contained half a dozen bats—probably little browns. It is best to place bat houses in full sunlight, since the bats have high body metabolisms and prefer very warm conditions for roosting during the summer. Think you’d like to build a bat house? Construction details can be found at the Bat Conservation International website at batcon.org. Bats are more than curious and beautiful creatures; they are also tremendously important components of a healthy environment. They are extremely important control agents of insect populations. Many of the insect species they eat are harmful crop pests, like army cutworm, or irritating or disease-carrying species like mosquitoes. 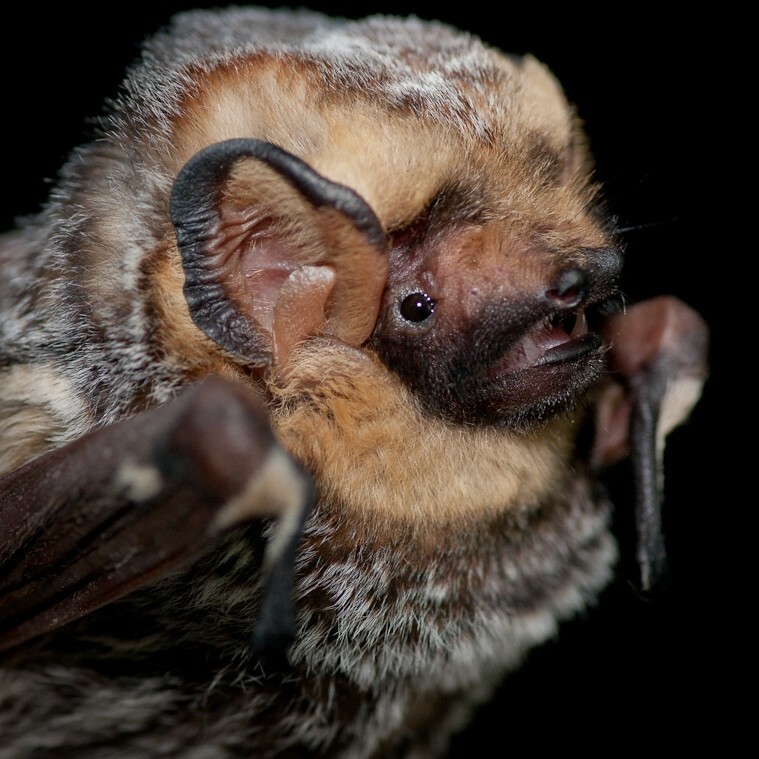 Some bats can consume more than 1,000 mosquitoes in a single night! Bats are in trouble now for many reasons—not the least of which are climate change, exotic diseases like white-nose syndrome, and habitat loss. Although bats are seldom seen and often have scary, erroneous wives-tales associated with them, we should be working hard to correct the problems that might lead to a truly silent night.